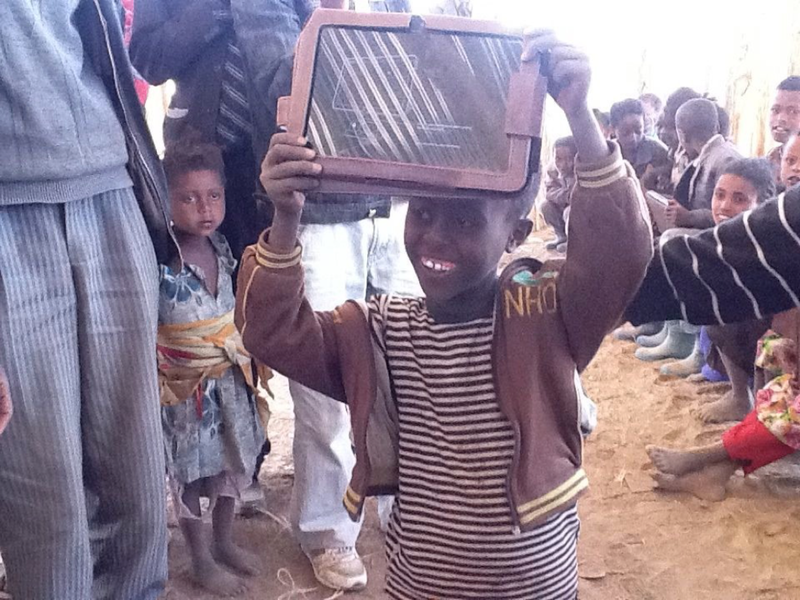 In April our colleague Markos traveled from Addis Ababa to Wonchi, a remote village in Ethiopia. His goal: to track down 20 children who had participated in a digital learning pilot, four years ago. What he found stunned our team – all six of the children he tested had taught themselves to read, using mobile software. The Pilot: Can Children Learn From Mobile Devices? In 2012, Markos collaborated with our team’s researchers at MIT, Tufts and GSU, to understand whether children could learn to use mobile software on a tablet, and what kind of impact this would have on early learning skills, like vocabulary, letter name and sound knowledge, and the ability to recognize simple words. We chose Wonchi because it was remote: there was no school, electricity or running water. Parents couldn’t read. Back then, no one in the community even had a cell phone. Our goal was simply to see if children could learn to use the tablets with no instruction, whether they would consistently use English language learning games, and if they would learn anything. We loaded tablets with hundreds of learning apps, e-books or videos, inspired by decades of research into the neuroscience of how the brain learns to read. Within minutes of seeing a tablet for the first time, one of the kids figured out how to turn it on. He jumped up, tablet held high, shouting, “Mine is on. I am a LION!” Soon, everyone learned how. Over the next year, children used the tablets almost daily — typically for around 4 hours, in mornings and evenings, before and after helping their parents in the field. Free to explore content, they began by sampling all of the apps and then focused on the simpler apps — focusing on activities like letter learning and English vocabulary. They used apps collaboratively, in ways we didn’t expect: children used “drawing” apps to practice their letters and quizzed each other to test whether they knew all their letters. At a similar pilot in Kampala, children opened the same music app and lined up their tablets to created a single long keyboard, for an impromptu jam session. Nine months later, our research team returned to measure what — if anything — kids had learned. We were stunned: when tested in English, children were performing comparable to US children in kindergarten. Since most children were scoring 60% in English vocabulary, it was possible that children had learned hundreds of words represented in the apps. And the top children were actually reading words in English. Altogether, typical children were performing like US kindergarteners who had attended preschool. After the first year, we continued to conduct assessments and continued to be surprised. The community continued to support the project even without funding — even today, 4 years later, a some of tablets are still active. Children continued learning, with overall performance increasing each testing period. But improvement was bimodal: nearly all children learned letter sounds and vocabulary, but only some were making the connection between letter sounds and written words. A major challenge was that our learning content was only available in English, so children couldn’t rely on word meaning to provide clues when learning to decode words. We believe that making content in their native Oromo would enable many more children to make this connection, bridging the gap you see in graphs below. Children made progress, but many remained at 0 for word reading. In March 2017, we were curious whether the children scoring highly on word reading were actually decoding words – truly reading – or if they were just recognizing clusters of letters by sight. And, if they were actually decoding in English, had they made the connection between letter sounds and reading in their own language, despite not having been exposed to Oromo content? When Markos found and tested six children in the Early Grade Reading Assessment — for both English and their native Afaan Oromo — the results were stunning. Two children were able to read 70% of 125 English words, even though they did not understand enough to answer comprehension questions. And all six were able to read Oromo words and passage, and answered most of the comprehension questions correctly. While it is possible these children had outside access to learning, children all reporting not having attended school. With no formal instruction or practice in their native language, these children had taught themselves to read at an 1st or 2nd grade level by US standards and at 3rd or 4th grade level by Ethiopian standards. Even this basic level of literacy has the potential to increase these children’s earning potential by ⅓ or more when they begin work, and transfer in turn to their children. Reading can allow them learn and increase their productivity, access public health information that reduces sick days, vote and access jobs that require basic literacy or a formal labor contract. Curious Learning is working to bring similar results to 175 million children who lack access to a quality school and will never learn to read. We’re in the process of creating local language learning apps in 100+ high-impact languages – from Afaan Oromo to Zulu – and distributing these for free by partnering with governments, NGOs, employers, and tech companies that already interact with parents. Finding volunteer translators. We’re looking for native speakers of African, Asian and Indigenous languages to translate an award-winning literacy app that we’re distributing for free (more info here: http://bit.ly/Localize-FTM). Please share this link with friends and on social media! Finding potential donors. We’re working to make free learning apps available in 100 high-impact languages that currently have no learning games. We can bring this content to a new language for $5K and are looking for supporters to make this happen. Please share or connect me with people who could find these supporters! Share this story. Repost this on Facebook, Twitter, LinkedIn, and send it directly to friends who might know potential funders, volunteer translators or distribution partners!